CRAZY DISCOUNT! Was: $119.95 Now: $39.98! 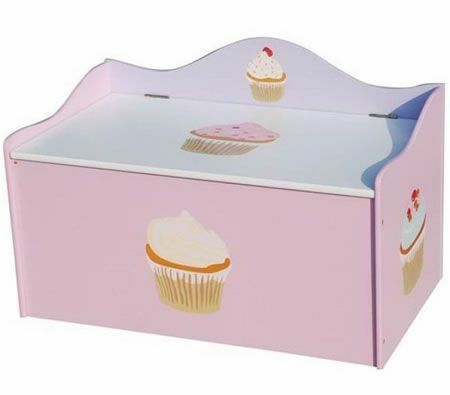 Give the kids something special with this cute cupcake themed childrens toybox. Unique and child friendly, the little ones will fall in love with this kids toybox in an instant. It comes flat packed with screws and is easy to assemble. This bright and colourful wooden toy box comes from the “Cupcake” series which also includes a matching table and chair set, 4 drawers set, coat stand and bookshelf suitable for girls. Super safe and fun to use, these kids furniture achieves all Australian Standard Safety Regulations. So complete your child's bedroom or playroom with a bright and colourful childrens toybox. *Note: MDF is an engineered wood that is exceptionally stable and offers an extremely tight and smooth surface. Mechanically refined wood fibres are combined with resin which is then bonded together under heat and pressure. We bought this small toy box for our granddaughters first birthday and so happy we did. It did not take long to assemble and the finish product was great. So glad the lid dosnt slam down and has a slow release when closing. The toy box came well packaged no marks or scratches. It is a cute toy box and we are so happy with our purchases. Thank you crazy sales for the quick delivery which was great. Bought for grandaughter and we both love it. lid is slow to shut so no fingers get caught. This product comes with 30 Days Manufacturer's Warranty, please click here for details.